In fact, politics in this country became heated long before that, about two decades ago when President Bill Clinton led the Democrats and Speaker Of The House Newt Gingrich was the leader of the Republican Revolution. 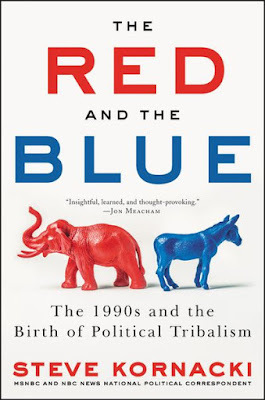 In the new and exhaustive book The Red and the Blue, MSNBC correspondent Steve Kornacki looks the birth of political tribalism in the 1990s—one that brings critical new understanding to our current political landscape. Kornacki follows the twin paths of Clinton and Gingrich, two larger-than-life politicians who exploited the weakened structure of their respective parties to attain the highest offices. For Clinton, that meant contorting himself around the various factions of the Democratic party to win the presidency. Gingrich employed a scorched-earth strategy to upend the permanent Republican minority in the House, making him Speaker. The Clinton and Gingrich battles were bare-knuckled brawls that brought about massive policy shifts and high-stakes showdowns—their collisions had far-reaching political consequences. The thing is the 1990s were not just about them. Kornacki writes about the major political moments of the decade, starting with New York Governor Mario Cuomo’s stubborn presence around Clinton’s 1992 campaign. Clinton's political shape-shifting at that time is now viewed as a stroke of genius, and it was especially novel then, as he was expected to run to the right of Cuomo, but quickly went left when Cuomo decided not to run. Gingrich, early in his time in Congress, delivered an overnight speech to an empty House chamber against Speaker Tip O'Neill, which made headlines and forced Tip to respond. That confrontational style was not common then, and it helped elevate Gingrich to become Speaker when Republicans won big in the 1994 midterms. This is the style that has defined the Republican party ever since, and is embodied now by the tough talk of President Trump. First Lady Hillary Clinton’s star turn came during the 1998 midterms, when she was the Democrats' most desired campaigner, during the Lewinsky scandal. she was particularly helpful to Chuck Schumer winning his Senate seat over incumbent Al D'Amato. Twenty years later, Schumer is the Minority leader in the Senate. For Hillary, it seeded the idea for her own candidacy for the other Senate seat from New York just two years later. Donald Trump made his political debut in 1999, when he flirted with a third-party run for president in 2000. He would have run on Ross Perot’s Reform Party ticket. Perot made a wild run as a third-party candidate for president in 1992 that inspired him to launch the Reform Party. Trump was drafted to run by Minnesota Governor Jesse Ventura, who was formerly a pro wrestler. His competition was Pat Buchanan, the conservative firebrand. Trump ran to Buchanan's left, calling him a white nationalist and a hate-monger. Trump eventually dropped out, and said in a New York Times op-ed that he might run again in the future. "The Republicans would serve as the loyal opposition, but when they looked at Clinton's victory, they weren't nearly as cowed. There was his unimposing plurality, along with hints that beneath the burst of goodwill that accompanied Clinton's triumph remained nagging misgivings about his honesty, his judgment, his character. The day after the election, Bob Dole declared himself 'a watchdog for the 57 percent' who hadn't voted for Clinton. 'If Bill Clinton has a mandate,' Dole said, 'then so do I.' It became a favorite Republican refrain, the ever-present reminder that Clinton hadn't even come close to winning a majority, implying that his presidency was accidental. And it meshed with another fashionable reading of the election on the right: that Bush lost by going wobbly on conservatism and getting cozy with Democrats. "This part was key, because it positioned Gingrich as a vindicated man inside his party." 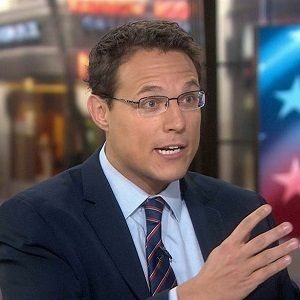 Kornacki sees the politics of a quarter century ago as setting the stage for the way our government functions - or doesn't function - in this era. Health care, taxes, gun control, and gay rights took center stage and remain hotly debated today. Politics then was marked by obstuctionism and extreme partisanship then, as it is now more than ever. The thing about the 1990s is that it is a period in our history that is not viewed as consequentially as it should be. It is the decade that bridged the end of the Cold War and the War on Terror, so it is viewed as a happy blip between two tumultuous periods. There were not many foreign policy events, the economy was strong, and pop culture was centered on scandals, teen dramas, and boy bands. In the spirit of Rick Perlstein's Nixonland and Chris Matthews' various books on Tip O'Neill and John F. Kennedy, Kornacki's narrative is told authoritatively and relevant to this political moment. With novelistic prose and a clear sense of history, Kornacki masterfully weaves together the various elements of this rambunctious and hugely impactful era in American history, whose effects set the stage for our current political landscape. The Red and the Blue is one of the finest books you will read this political season, and will help you understand this moment more than ever before.